Christmas carols are playing on Pandora, glitter is on the floor, and I’m busy planning my holiday meal. Prime rib is on the menu this year and I’ve opted for a gold and crystal holiday table setting. 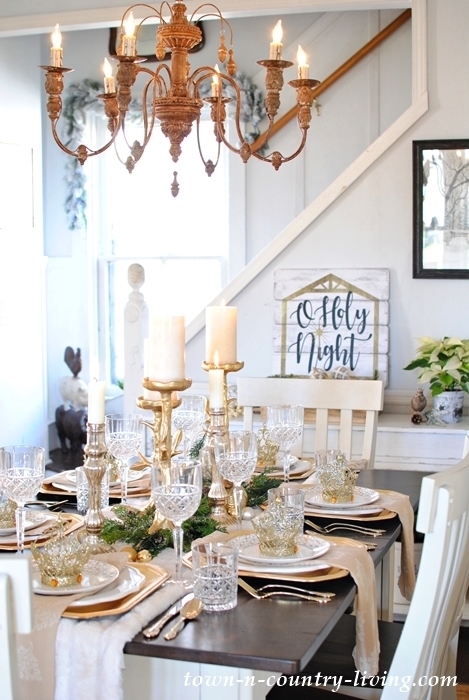 All week my blogging friends and I are featuring holiday tablescapes as part of the Styled + Set series organized by Lory at Designthusiasm. 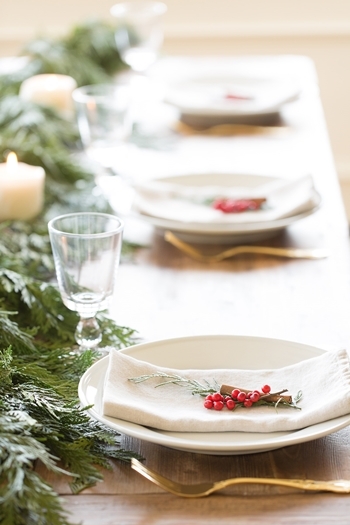 You can visit everyone’s table settings at the links at the end of this post. 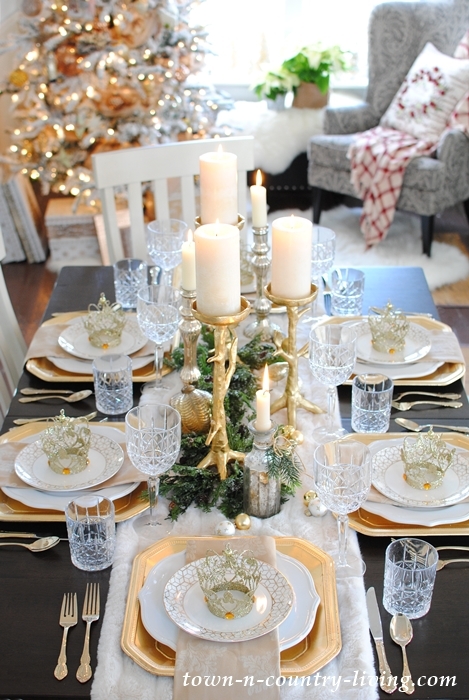 I knew gold was going to be the central color of this year’s holiday table setting when I spied gold chargers in a square shape at HomeGoods. I’ve had the gold flatware for years and like to bring it out for special occasions. 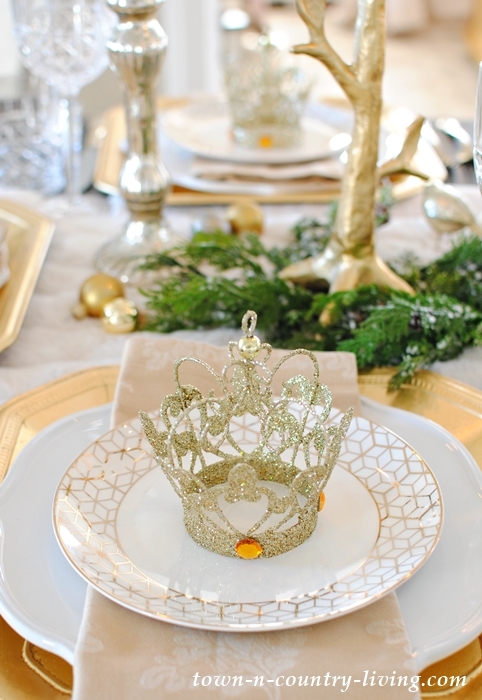 A search for a small gift left at each place setting led me to sparkly bejeweled French crown ornaments. They can hang from a Christmas tree or used as a tree topper for a smaller tree. 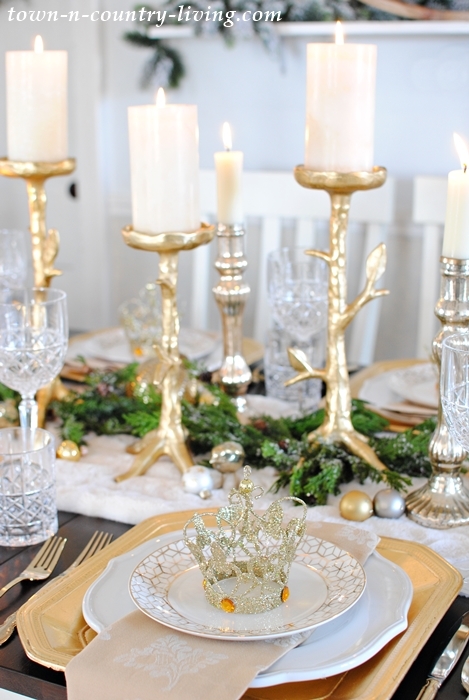 Golden tree-like candle holders are the focal point of my gold and crystal holiday table setting. 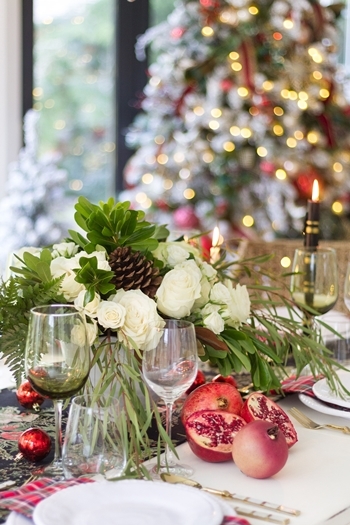 A few sprigs of greenery and shiny baubles complete the centerpiece. A couple of golden birdies make the scene, too. You saw a couple of these little guys on my Christmas mantel yesterday. 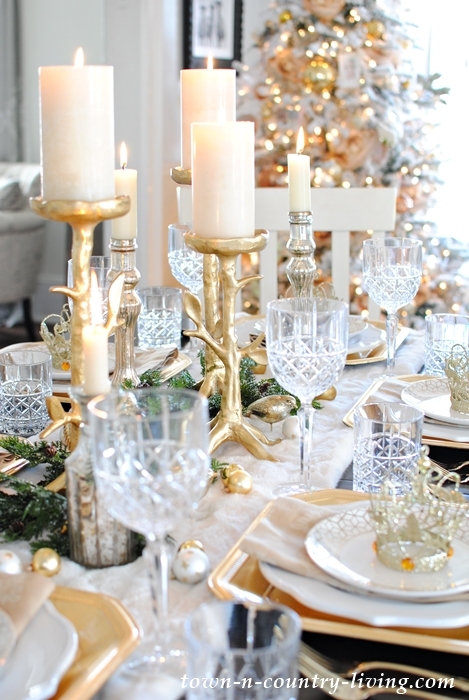 And the crystal part of my gold and crystal holiday table setting? 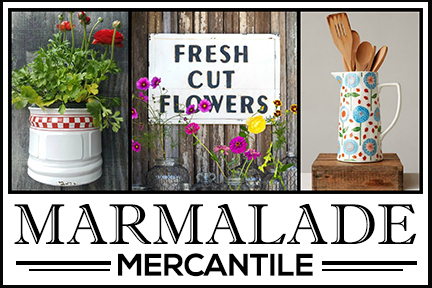 I found beautiful Waterford crystal goblets and tumblers in the Brady pattern at HomeGoods for a bargain! My mother handed down a set of Waterford crystal to me, which I recently handed down to my daughter. I maybe shouldn’t have done that so soon but she enjoys them. And anyhow, I like my new Waterford crystal. I’ve been waiting for the right time to show you my new chandelier – and now seems like the perfect time. I absolutely adore it! We can adjust it to hang high or low – and we added a couple of ceiling hooks so when the table is fully extended to eleven feet, we can move and center the chandelier appropriately. 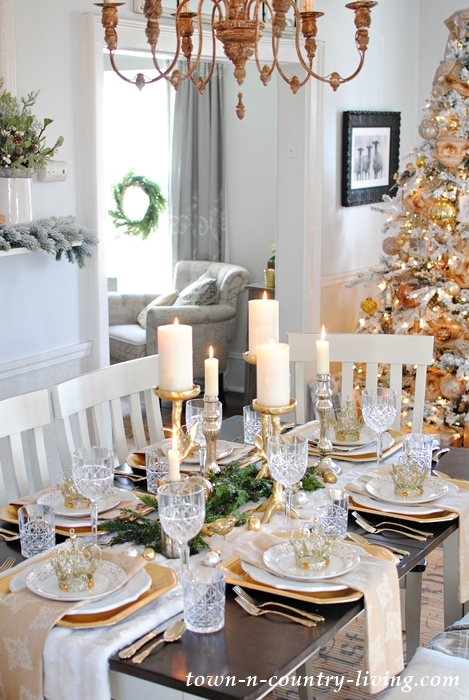 For my gold and crystal holiday table setting, I kept the table to its smallest size that seats six people. On Thanksgiving the table was fully extended to seat twelve people comfortably – it can easily fit 14 folks if necessary. The table fits along the short wall in this former living room when not expanded. It stretches almost all the way to the tree when fully extended – with just enough room for a person to fit comfortably at the head of the table. I’m just so happy with my new dining table and chairs. 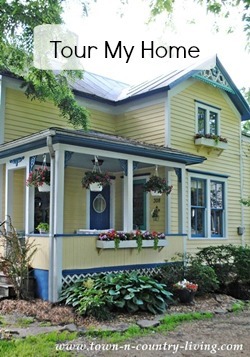 One of the best decisions in this house was to swap the living and dining rooms. 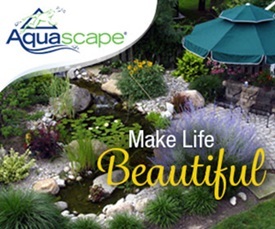 Now I can be more creative with my tablescapes and seat family and friends comfortably. 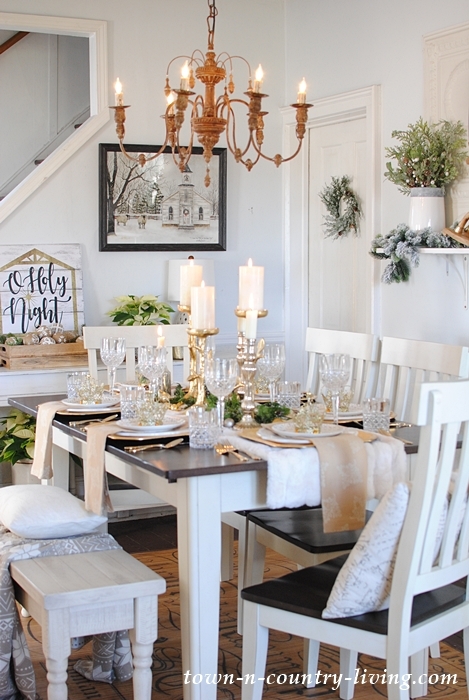 Stop back tomorrow for Part One of my Christmas home tour! 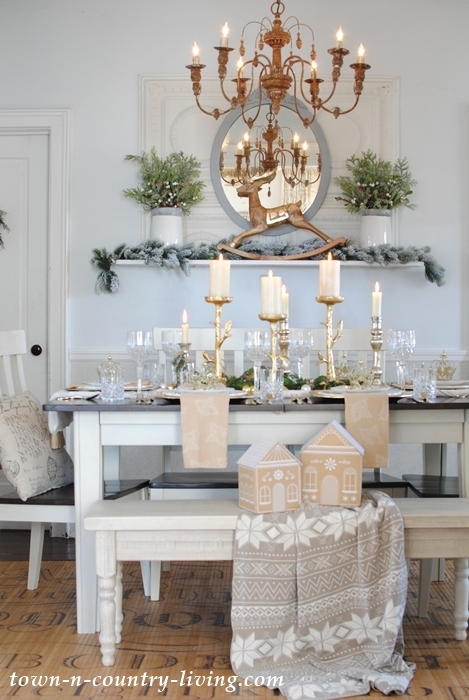 Hopefully you’ll find inspiration for decorating your own home this holiday season. 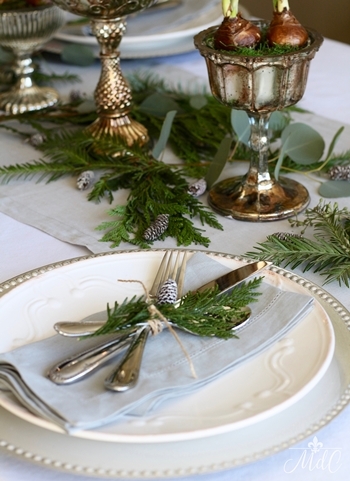 For now, be sure to visit the rest of the festive holiday table settings from my blogging friends listed below! 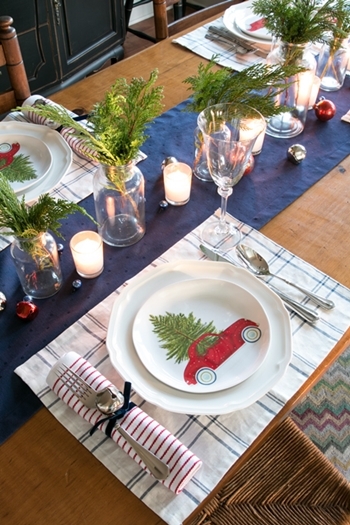 Next up on today’s tour is Julie Blanner‘s beautiful table and centerpiece! I love the gold and crystal theme – and the new chandelier. It shows so well with the style of your home. Also, am looking forward to your home tour and love the switch you made between the rooms. It must be so beautiful in person. 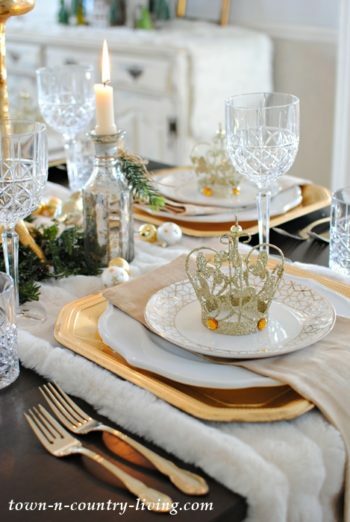 I love how elegant your table is with all the gold. 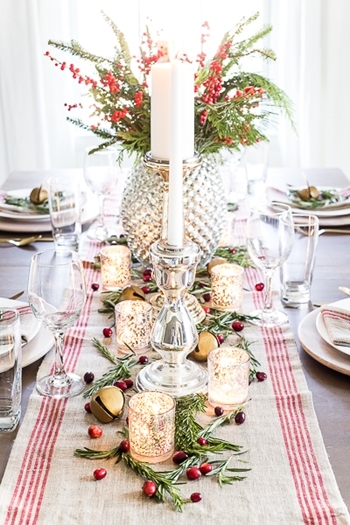 Everything just shimmers and it’s so festive! And I’m in love with your chandelier! It looks great in the room Jennifer! It is beautiful. 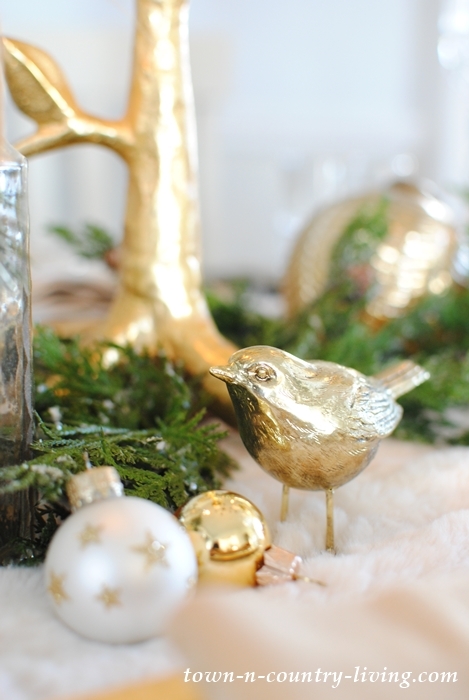 I LOVE the gold bird – where did you get it? Your table is stunning, makes a beautiful setting to make everyone feel special. What a lovely light. Beautiful! 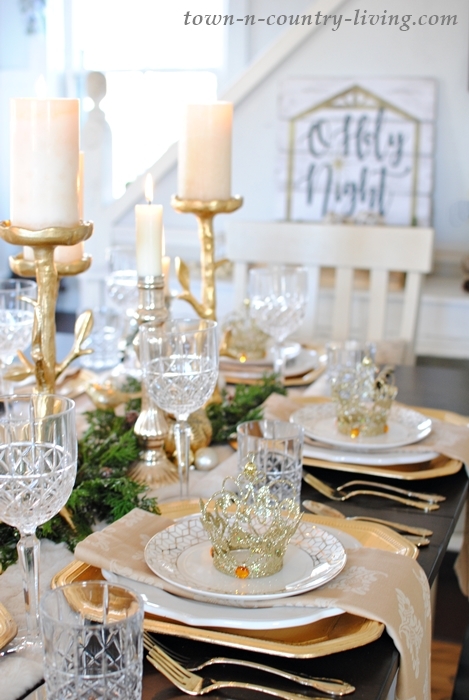 I love the gold and your table runners adds an extra warm and cozy feel! 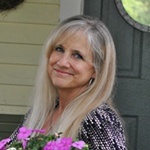 Oh Jennifer, I’ve been looking at your home photos for a long, long time and think your cozy corner is one of your best yet! Such beautiful Christmas for you and your family this year! Merry Christmas!! Oh my goodness, Jennifer! 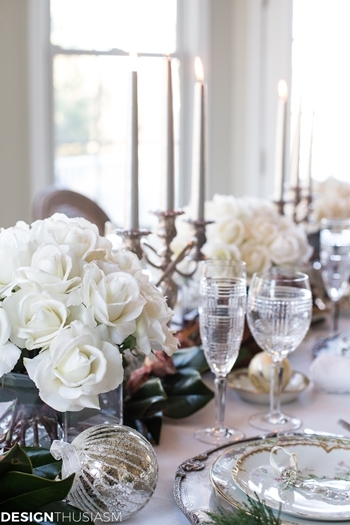 Your table setting is just gorgeous! Love those crowns!